Okay. So now that you know how much fun baccalaureate was, it's time for me to talk about graduation. My last day of school was certainly fun. I started, once again, in my first period independent study, only this time I was blogging, which I finished during second period. My Calculus teacher actually approached me during this time regarding putting my name on a plaque for the American Mathematics Contest... six times. Yes, that's right. Once for each of the two years I had the high score on the tenth-grade version, one for each of the two years I had the high score on the twelfth-grade version, and once for each of the all-time school records I hold on both. Fourth period was uneventful. My AP Government teacher, who actually teaches seventh-grade World Cultures, didn't even come over from the middle school, so I just found another class and watched a movie with them. That was cool. Then came third period, band and choir, with lunch in between. That was wonderful; not much to do but sit and enjoy it. I just had a couple of last-minute errands to run around the building, and that was that. Oh, and I started chewing a piece of gum toward the end of class. School let out at 12:35, two hours early, but I had to stick around. I had talked to the senior English teacher about practicing my speech in the auditorium to get accustomed to the acoustics. So after running into the principal, who informed me that he had been waiting eight years for me to be out of his hair and that I should leave already, I found her at the faculty barbecue that was being held after all the students had left. We went into the empty auditorium, closed the doors behind us, and after taking the gum out of my mouth and setting it aside, I gave my speech. Somewhere around the middle, I saw my father, who had come to the school to see the band director, peeking in the auditorium door. He claims he was just wondering where I was, but I really think he wanted a "sneak peek" at my speech. I don't blame him. When I finished, the teacher simply raised her hands up in the air and clapped. Okay, I think I can do this now. I thanked her for listening, as by then, the food at the barbecue had probably been well picked over. I then went to my locker with the piece of gum, opened it up, and stuck it in a corner. Why? Simple. Back in the eighth grade, when I was taking a math class at the high school because I had exhausted the middle school curriculum, I needed a place to put my stuff. The principal assigned me a locker there, and when I opened it I was greeted with a butterfly sticker next to a little note, scrawled in pen by a previous owner of the locker. 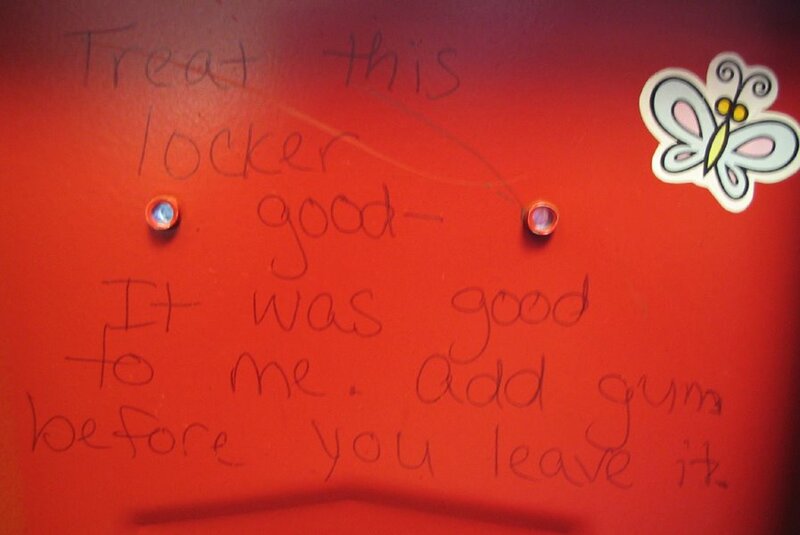 It read, "Treat this locker good– It was good to me. Add gum before you leave it." So naturally, after five years of not having any trouble caused by my locker whatsoever, I had to add gum. And I hardly ever chew gum. But I did anyways. I finally got home around 13:15, which gave me more than enough time to jump in the shower and get cleaned up before my grandparents came up for the big event. We soon went to dinner at a very nice restaurant just outside of town. It was very good. A wonderful meal just before an event like that. Then came the big moment. Graduation. Whoa. The ceremony went well. During the ceremony I was awarded the National School Choral Award and a $500 scholarship in memory of a former math teacher who died of leukemia. Then, before I knew it, it was time to give my speech. I was practically shaking at first, the tassel on my cap started attacking my face as I used many animated gestures during the seven-minute speech. It really didn't seem like seven minutes, though. When I got to the part about it being surreal and feeling like a dream, it was surreal, and it kind of felt like a dream. By the time I got to page two, though, I had confidence in myself, and I just let the rest of the words flow. It felt good. Then the superintendent made some short remarks, and it was time for the diplomas already. Eek! I couldn't believe it, and I'm sure that not many other people in that room could either. By 21:41, we were presented as the Class of 2006, we moved our tassels to the other side of our caps, and many people popped party poppers and threw their caps in the air, despite the warnings on the bag saying, "do not throw this cap in the air." Ladies and gentleman, high school graduates. After my family left, my mother took my to my girlfriend's aunt's house for a little bonfire she was having. That was fun. I spent a couple of hours with her and some of her friends, then I had to head home. The only problem was, it was 01:15. My mother wasn't about to stay up that late just to drive me home. So I had to walk. I heard a train go by. Luckily, it wasn't going by on the tracks I had to cross, because that would be a pain, waiting for a train while traveling on foot in the middle of the night (as if it's not a pain to begin with). You must be old, graduate. I don't ever wanna graduate. I might just fail every single class my senior year for the rest of my life so I don't have to. I don't know if I'm scared to graduate, or if I just don't like change. Graduation for our school was pretty long and boring. Maybe it's because I wasn't the one graduating. Maybe it's because the band (which I was playing in) really sucked. Or maybe it's because it was the first graduation I had ever been to and I didn't realize that it was all about people talking, and listing all 500 or so names, and more people talking. And what they said was all a bunch of nothing that they probably didn't even mean. It sounds though like yours was better. You spelled bouquet wrong, you spelled it bouqet, Mr. "likes to sign on to my blog and fix errors"
Our band plays "Theme from Pomp and Circumstance: March No. 1 - Land of Hope and Glory" and then "The Star-Spangled Banner" at the beginning. Then they literally sneak out of the auditorium (they're seated behind the graduates) and go into the music room or outside, where they play Xbox or Ultimate Frisbee or something like that. Then when they get about halfway through handing out the diplomas, around an hour and a half later, the sneak back in, ready to play the Alma Mater and "Proud Heritage" at the end. Typically no one knows they ever left. And Laurel, it's been months since I logged in as you without your permission... teehee. See, in our graduation band, we are put up in front of everyone, and we can't leave. Plus we play dumb songs that middle school students could play. You can now read my salutatory address (a.k.a. "speech") here.